Carbon monoxide (CO) is often called the silent killer because it is odorless, tasteless, and invisible, making this toxic gas one of the most overlooked dangers in homes. The Centers for Disease Control and Prevention estimates that annually close to 450 people die and 20,000 people are admitted to the emergency room as a result of unintentional carbon monoxide poisoning. Both numbers spike during winter months when heating systems are working overtime. To keep you and your family safe, understand the many sources of carbon monoxide in your home, as well as ways to test for carbon monoxide. Carbon monoxide is produced by gas, oil, coal, charcoal, and wood fuels that have burned incompletely. Carbon monoxide is more common among older furnaces as well as full HVAC systems and gas water heaters that have not been properly vented. Electric furnaces, electric water heaters, electric ovens, and all other electrically powered devices operating normally do not produce carbon monoxide. The ultimate and most accurate way to detect the presence of carbon monoxide in the home is with an indoor air quality test. Private companies are available to perform indoor air quality and improvement tests that include carbon monoxide testing. Some municipal fire departments and utility companies will come to your home and check for carbon monoxide for free or at reduced rates. The main tool used in these tests is an electronic portable toxic multi-gas monitor. This device differs from the consumer-level carbon monoxide detectors in that it can be calibrated to detect trace carbon monoxide gas from nearly zero parts per million (ppm) and at increments as small as 1 ppm. In addition to testing for carbon monoxide, most of the private companies will test for other harmful pollutants, such as mold, allergens, radon, formaldehyde, and more. If you or the testing company believe that the HVAC system is the source of the carbon monoxide, you can contract with an HVAC company to check your system with a combustion analyzer. A combustion analyzer is an electronic device that tests vented gasses directly coming from furnaces to ensure that the ratio of carbon monoxide to oxygen remains within a safe range. A combustion analyzer tests only gasses combusted directly from a furnace, not overall air quality. The device tends to be too expensive and limited in use for most do-it-yourselfers to purchase. Many HVAC companies and on-site air quality testing companies do not own combustion analyzers, so check with the company in advance before they come to your house. The easiest way to see if there is carbon monoxide inside your home is with a carbon monoxide detector (which also includes an alarm). In fact, many building codes require a carbon monoxide gas detector. If you do not have carbon monoxide gas detectors in your home, not only are you putting you and your family at risk, but an inspector could also flag you and prevent the sale of your home or condo. Such off-the-shelf carbon monoxide gas detectors are valuable but not as accurate as electronic portable toxic multi-gas monitors since they typically measure only down to 30 ppm. 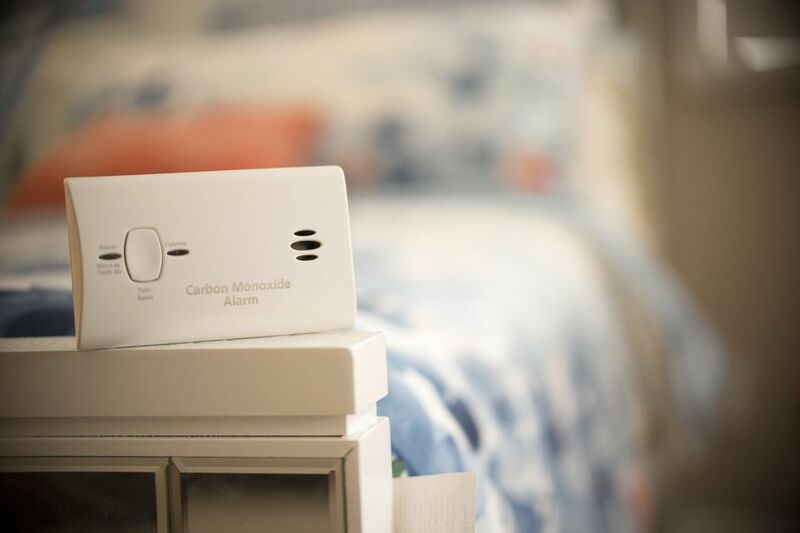 The aim of these carbon monoxide gas detectors, too, is to act as the last layer of warning to protect individuals in habitable areas such as bedrooms, dining rooms, living areas, and hallways. These carbon monoxide gas detectors are not meant to detect carbon monoxide gas at suspected locations of origins such as furnace rooms or even in kitchens. In fact, most of these carbon monoxide gas detectors should be installed beyond a radius specified by the detectors' instructions: 5 feet or more beyond cooking appliances and 20 feet or more beyond furnaces, for example. While everyone is prone to carbon monoxide poisoning, infants, the elderly, and those with heart disease, anemia, and breathing problems are more likely to get sick. If you suspect the presence of carbon monoxide in your home, leave the home immediately and call the fire department or a professional on-site air testing company. Open all of the windows and doors and turn off all stoves, your HVAC system, and the water heater.